Mount Gundabad is an adventure pack of 60 fixed cards for Ered Mithrin expansion to The Lord of the Rings: The Card Game. The contents of this pack were designed to augment existing decks and to provide players with an entirely new scenario upon which their heroes can adventure. Contains cards 112-144 of the Ered Mithrin cycle. 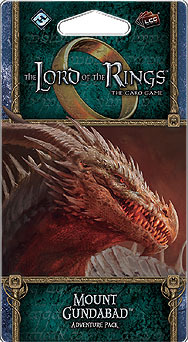 The Lord of the Rings LCG core set and Wilds of Rhovanion deluxe expansion are required to play.